While not my first published photo ever, this one certainly will get a lot of viewers. 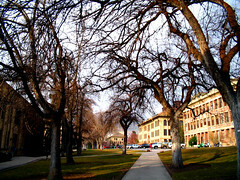 UEN picked it up as a "campus photo" to try and get people to click on their March newsletter. They are a pretty large site as far as education goes in the state of Utah. I do not know how long it will be there on their front page, but it is cool to see your picture on a site like that, even if only in thumbnail form. It helps when your father is part of their PR team. But good for you, he subscribes to your flickr! photostream. Friendly competition is always welcome and encouraged. Your time delay stuff is pretty amazing. Those not familiar with Jon's photos should go visit his blog.